MyMemories Blog: Meet this week's Featured Designer! It's Emily from *Polka Dot Pixels*! Meet this week's Featured Designer! It's Emily from *Polka Dot Pixels*! Header Banner kit: Frozen Combo Pack from Polka Dot Pixels! Meet this week's Featured Designer!! It's Emily from Polka Dot Pixels!! Here are some fun things she'd like you to know about her!! Be sure to check out the BLOG POST to enter her giveaway! My name is Emily, and I design under the name Polka Dot Pixels. I live in Tennessee with my hubs of 31 years, Larry. I have two daughters, Sara and Katie, a son-in-law Drew and our new grand baby, Ellen. I adore being the Granny to this lovely creature. My family is everything to me. I believe that I will never do anything better than bringing two lovelies into this world. I accidentally fell into a design career in 2005, while helping out my daughter's high school with their website, as I was the parent with the most computer knowledge. That grew into blog and web design for others, which I instantly fell in love with. I started out with PS Elements on a PC and then progressed to Photoshop and Illustrator on my Macs, soaking up every online tutorial and spending hours "figuring it out". 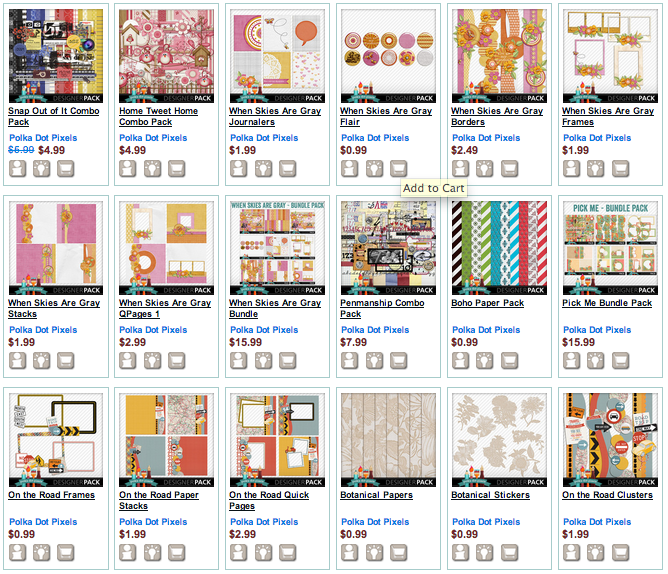 The love of digital art and design led me to find digital scrapbooking. It was a natural progression for me, as I have always been a scrapper-crafter-doodler-artsy type. I began obsessing over collecting all kinds of digital artwork and creating my own fun graphics for my web clients and for my personal projects and website. Check out some of the #AWESOME goodies in her shop! I had to giggle when you said Squirrel! We tease my daughter all the time about her distractability. We can also say Bacon and it has the same affect. Love your kits. I, like you, can spend hours searching on the web for just the perfect things for a project. I'm a sucker for anything school related, so I love your School Days kits.